This project is available in both Bangkok and Chiang Mai. In this project, your daily commute will carry you through some of central Bangkok and Chiang Mai’s most authentic neighborhoods. All of the involved schools are in the city center – most within the boundaries of the ancient moat. Some are part of larger temple complexes, complete with monastic communities and Buddhist shrines; others are stationed on dedicated school grounds. Each has its own dynamic, with anywhere from 100 to 1,000 students enrolled. Volunteer teachers have the option to work in any grade level. 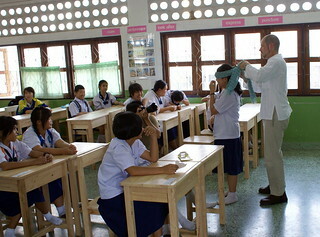 Participation in the English Education Volunteer Project starts at a minimum of two weeks at $799. Each additional week is $119 per week.